A Chinese passenger jet slid off the runway as it landed at Manila airport in torrential rain forcing dozens of flight cancellations on Friday, as engineers struggled to remove the stricken aircraft. 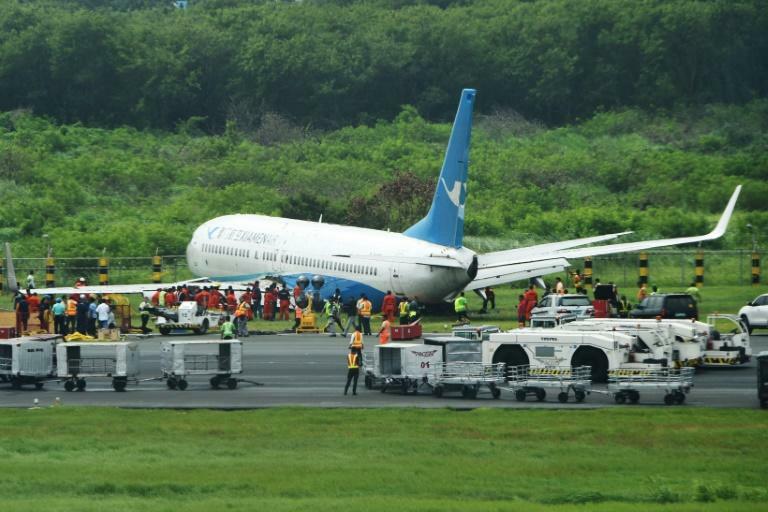 The Xiamen Airlines plane, carrying 157 passengers and eight crew, landed on its second attempt before skidding onto the grass and ripping off its left engine late Thursday evening, airport general manager Ed Monreal said. All on board were safely evacuated from the aircraft with no serious injuries. But nearly 24 hours after the accident, rescue crews were still unable to remove the plane, forcing the airport to cancel take-offs and landings from the largest of its two runways. An official statement said the runway would remain closed until around 5:00am Saturday (2100 GMT Friday) as two cranes were still being put in place to lift the plane. Civil Aviation Authority of the Philippines spokesman Eric Apolonio said at least 67 local and international flights were cancelled on Friday. He told AFP that recovery efforts were being hampered by recent heavy rains that had softened the ground around the runway, making it difficult to lift the aircraft. Four people suffered "superficial scratches" as they evacuated the Boeing 737-800 jet, which had flown to the Philippine capital from Xiamen in southeast China, airpor general manager Monreal said. "With God's blessings all passengers were able to evacuate safely," Monreal said, adding the cause of the incident was under investigation. The second runway for smaller aircraft remained open, but the authorities said the accident has delayed thousands of passengers, including holidaymakers travelling ahead of a long weekend. Footage from the main airport terminal showed hundreds of passengers still lined up as they sought to re-book their flights. Many angry comments appeared on social media Friday. "The roads are at a standstill and the main runway at (the airport) is closed. Inept and incompetence at its finest. Welcome to the Philippines," one person said in a tweet.